Works 4 You is a social enterprise based in Cleator Moor providing training and employment opportunities in home and landscape improvements. Any income generated from Works 4 You is gift aided to registered charity Home to Work Ltd.
Home to Work received funding from the NMP Community Fund last year to contribute towards the Skills 4 You project. With high levels of unemployment throughout Copeland, it has been a success for Skills 4 You and Home to Work to have released all of their pilot course graduates either into the working world of employment or into further traineeships and apprenticeships, with the skill of joinery. The course gives those on it valuable employment skills along with a allowing previously unemployed people to socialise with a new group of people, create bonds, and learn in a safe, comfortable and supportive environment. It provides a range of learning opportunities including short courses and basic skills leading to appropriate mainstream accredited courses. 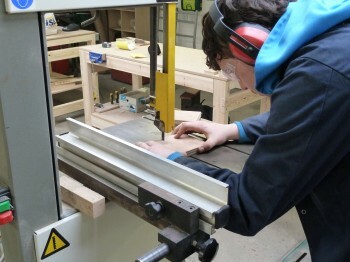 Activities include furniture restoration, recycling salvaged timber to include garden furniture making, local community/organisation’s furniture projects e.g. planters, picnic tables; and creating simple wooden items e.g. small toys, bird boxes, bird tables, wooden sandpits.